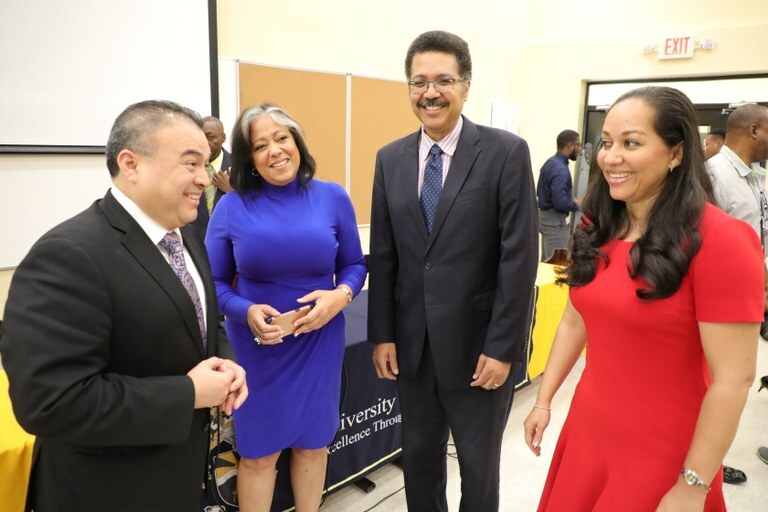 UTech, Jamaica Hosts OAS 70th Anniversary Lecture and Roundtable Discussion on Sustainable Energy — UTech, Ja. Sharing a light moment from left: His Excellency Nestor Mendez, Organisation of American States (OAS) Assistant Secretary General, Mrs. Hillary Alexander, Permanent Secretary, Ministry of Science, Energy and Technology, Professor Stephen Vasciannie, CD, President, University of Technology, Jamaica and Ms. Jeanelle van GlaanenWeygel, Representative, OAS Office of the General Secretariat in Jamaica. 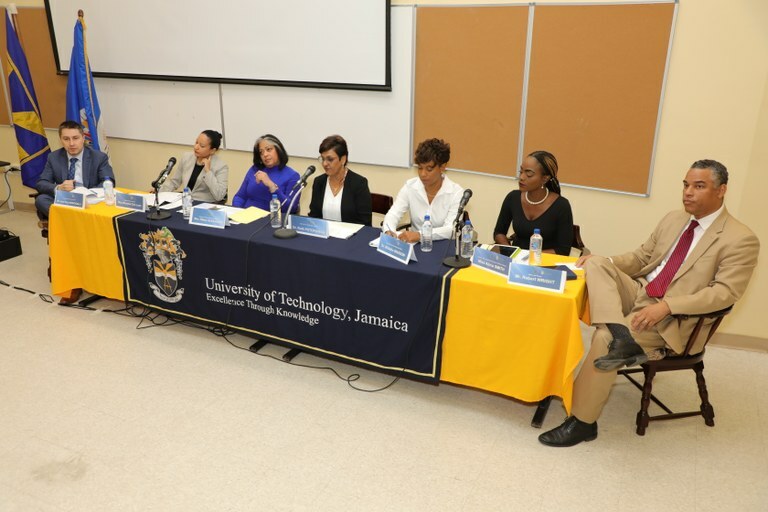 The occasion was the OAS 70th Anniversary Lecture and Roundtable Discussion on “The Caribbean Sustainable Energy Challenge” hosted by the University of Technology, Jamaica, Papine Campus on Tuesday, March 6, 2018. The objectives of the discussion were to facilitate dialogue to explore ways in which countries can take advantage of the technical and financial mechanisms at their disposal to advance energy sector transformation in the Caribbean. Professor Stephen Vasciannie, CD, President, UTech, Jamaica in welcoming the partnership with the OAS for the public dialogue on the important issue of sustainable energy, noted that, “the challenges we face in energy security are of paramount concern to governments and citizens across the globe.” He added that “the high cost of electricity is a significant drain for national and household budgets and a major hurdle to economic growth and prosperity.” He congratulated the OAS on its 70th Anniversary, noting that the Organisation “has been a source of critical support to Member States in building human capacity in many areas such as electoral observations, trade negotiations, natural disasters mitigation, governance, scholarships and development projects.” The President expressed hope that the University will work more closely with the OAS in other areas such as education, infrastructural efforts and in security matters, including cybercrimes. The keynote address was delivered by His Excellency Nestor Mendez, Assistant Secretary General, OAS. While noting that many Island States are doing their part to advance energy transformation and to take advantage of the opportunities available to them to deliver modern and affordable energy services, the Ambassador said there is tremendous untapped potential to improve energy efficiency, reliability, sustainability and affordability. He emphasised the need to improve energy infrastructure within the Caribbean to withstand the onslaught of prevalent natural disasters such as earthquakes, floods and hurricanes. He cited encouraging examples of investments in energy sustainability in some Caribbean States. He noted that Trinidad and Tobago is encouraging the use of vehicles that run on compressed natural gas and has also removed import duties and other taxes on hybrid and electric vehicles. In Barbados there has been an increase in the use of solar panels and water heaters in private homes, government buildings, police stations and bus shelters, and in St. Vincent and the Grenadines they are examining ways of making its government buildings more energy efficient. He also praised Jamaica’s investment of more than $40M dollars to build out a 7 megawatt geothermal power plant that will reduce the dependency on fossil fuels, and plans by the Jamaica Public Service Company to build a 34.5 megawatt facility to store energy as a safeguard against power outages, as well as the development of the government-owned Wigton Windfarm Ltd. with a wind capacity of 62.7 megawatts. “These examples are a testament to the resolve of government, the private sector and citizens in the Caribbean to build a sustainable and resilient energy sector,” the Ambassador noted. He shared further that “the OAS has had a longstanding engagement in sustainable energy in the Caribbean for almost 20 years through its Department of Sustainable Development which has designed and implemented several critical programmes to support policy reform and energy sector transformation in its Caribbean Member States.” He called on UTech, Jamaica students to put forward their ideas for energy solutions into concrete proposals to address the sustainable energy challenge in the Caribbean. 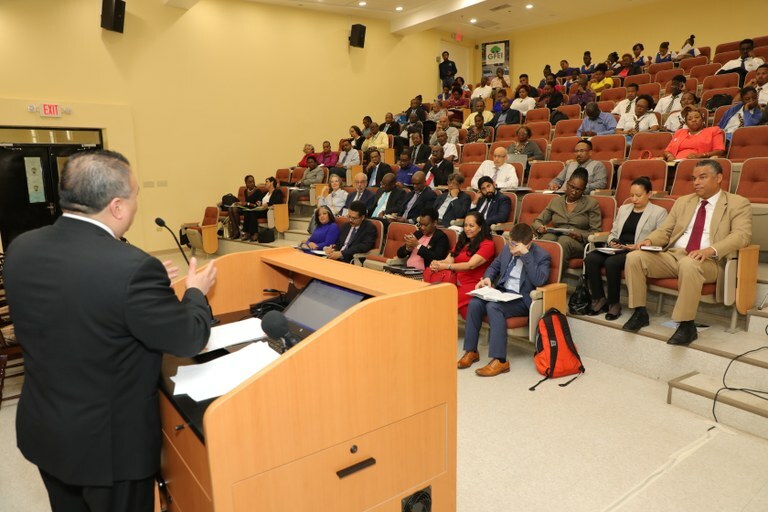 Assistant Secretary General of the Organisation of American States, (OAS) His Excellency Nestor Mendez addressing the audience at the 70th Anniversary Lecture and Roundtable Discussion on “The Caribbean Sustainable Energy Challenge,” at the university’s Shared Facilities Building, Papine Campus on Tuesday, March 6, 2018. President Vasciannie shared further that UTech, Jamaica has been playing its part to advance energy efficiency and sustainability through a number of projects. These include a partnership forged with the Jamaica Public Service (JPS) in 2014 for the commissioning of a 100kW solar voltaic unit on the Papine Campus aimed at reducing the University’s electricity consumption. In 2017 the JPS handed over full operation of the plant to UTech, Jamaica. The solar energy facility has resulted in savings to the University of US$25,017.83. In another project, UTech, Jamaica engineering students and faculty recently working with JPS to design “Ready Boards” which have been installed on the JPS power grid to provide electricity to the community of Majesty Gardens in Kingston; and in March 2017 the University launched the Master of Science in Sustainable Energy and Climate Change, the first of its kind in the Caribbean to provide tertiary level training in support of building a sustainable energy economy. A panel discussion elaborating on the theme “The Caribbean Sustainable Energy Challenge,” followed the lecture, moderated by Dr. Ruth Potopsingh, Associate Vice President, Sustainable Energy and Head, Caribbean Sustainable Energy and Innovation Institute (CSEII), UTech, Jamaica. The panellists all reinforced the need for more investment in strategies and policies to enhance the resilience of energy infrastructure in Jamaica and the region. Panelist, Mr Juan Cruz Monticelli, Senior Energy Specialist, OAS Department of Sustainable Energy shared on the projects implemented by the OAS through the Energy and Climate Partnership of the Americas (ECPA) to address the issue of sustainable energy and to impact policy, cooperation and financing in the region for the next three decades. Dr. Malaika Masson, Regional Energy Specialist, Country Offices, Jamaica and Bahamas, InterAmerican Development Bank (IDB) provided an overview of some of the various financing arrangements that have been provided by the bank as a key financial partner working with agencies of Government and other key partners in Latin America and the Caribbean region in support of infrastructural improvements for energy management and efficiency. Miss Michelle Chin Lenn, Project Manager of Wigton Windfarm Limited explained the opportunities and challenges that have enabled the Windfarm to evolve since 2000 to become the largest company in commercial renewable energy in Jamaica and the Caribbean. The company operates a 38.5 MW wind farm from which it sells electricity to the Jamaica Public Service Company (JPSCo) under an executed power purchase agreement (PPA). Mr. Robert Wright, Managing Director, New Leaf Power in his remarks, asserted that the Government has provided an enabling environment for businesses to invest in the renewable energy sector, however he noted that improved financing is needed for small residential players to finance technical projects. He reminded the gathering of academics, students, private and public sector representatives from the energy sector that solar energy solutions must be used in tandem with conservation efforts to realise savings. Miss Alicia Smith, Habitat Coordinator, Ministry of Economic Growth and Job Creation who is also a student in the UTech, Jamaica Master of Science in Sustainable Energy and Climate Change, encouraged high school students present to think of creative, entrepreneurial solutions to Jamaica’s energy challenge. Panellists from left, Mr Juan Cruz Monticelli, Senior Energy Specialist, OAS Department of Sustainable Energy, Miss Michelle Chin Lenn, Project Manager, Wigton Windfarm Ltd., Mrs Hillary Alexander, Permanent Secretary, Ministry of Science, Energy and Technology, Dr. Ruth Potopsingh Associate Vice President, Sustainable Energy, UTech, Jamaica and moderator, Dr. Malaika Masson, Regional Energy Specialist, Country Offices, Jamaica and Bahamas, IDB, Miss Alicia Smith, Habitat Coordinator, Ministry of Economic Growth and Job Creation and Mr Robert Wright, Managing Director, New Leaf Power.